Introduction: Patients with type 2 diabetes (T2DM) have exaggerated brachial and central (ascending aortic) blood pressure (BP) during exercise, which is associated with adverse outcomes. Central systolic loading, represented by the augmentation index (AIx), may contribute to exaggerated exercise central BP. This study sought to compare the central AIx response to peak exercise in T2DM and control patients and identify mechanisms of altered exercise central AIx. 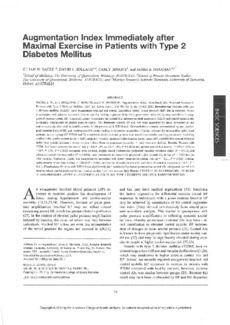 Methods: Central BP and AIx were quantified by radial tonometry at rest and immediately following peak treadmill exercise in 106 patients with T2DM and 106 nondiabetic controls, pairmatched by age, gender, peak exercise brachial BP and the post-exercise heart rate (HR) corresponding to tonometry acquisition. Cardiac volumes (by echocardiography) were assessed in a subgroup (22 T2DM and 22 controls) to derive rest and post-exercise arterial-ventricular coupling parameters, including cardiac index (stroke volume x HR), peripheral vascular resistance index (PVRI; cardiac index/mean BP), and effective arterial elastance index (EaI; end systolic pressure/stroke volume index). Reserve parameters (exercise - rest) were also defined. Results: Patients with T2DM had lower post-exercise central AIx (-1 ± 13% vs. 3 ± 14%; P = 0.038) and greater central AIx reserve (-24 ± 13% vs. -20 ± 11%; P = 0.002) compared with controls, despite raised post-exercise PVRI (P = 0.013) and EaI (P = 0.011); these parameters independently predicted higher central AIx at rest (P < 0.01), but not post-exercise. Moreover, T2DM was independently associated with lower post-exercise central AIx (β = -0.19, P = 0.01). Cardiac index reserve, which was blunted in T2DM (P = 0.004), represented the only independent correlate of central AIx reserve (r = 0.39, P = 0.01). Conclusion: Patients with T2DM have significantly (and paradoxically) lower post-exercise central AIx and greater central AIx reserve, which may be explained by impaired cardiac functional reserve.